As you can tell I like scented products for the body. I tend towards bakery scents and anything fruity. I was out of body wash and at Target, nothing fruity and cruelty free was on the shelves and I needed something. 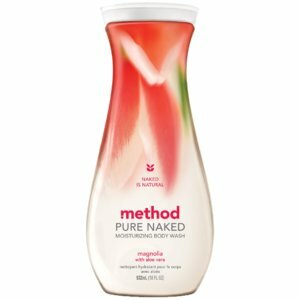 I reached for Method's Magnolia and Aloe Vera scented body wash - not really wanting a floral (but I was desperate). I liked the smell right away, it smelled familiar, clean and comforting. In the shower it lathers well, for a scented product it does not irritate my skin or leave it feeling dry, it is easy to get out of the bottle and the formula is silky. Out of the shower the smell lingers and it it subtle and pretty. A nice touch is my skin feels moisturized and squeaky clean. I have bought this body wash a few times now. It is under $6 for a large bottle and with daily use it lasts about a month or more if you are like me and like creating lots of lather .